War had finally reached the parched and strategic planet Begoff—an inhospitable land, but one rich in rare Goatronium. A combined force of Tyranids and Orks (1,000 points each) arrived to confront the Chaotic forces of Slaanesh (2,000 points). 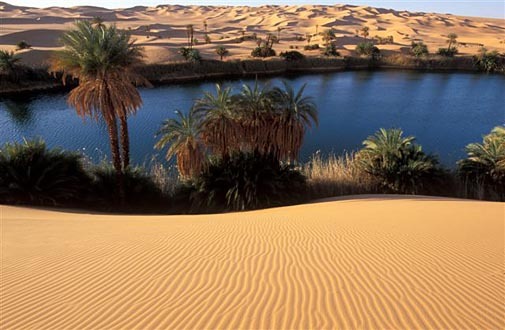 Both sides sought to control one of the few local water supplies—the small village and oasis of Ibn Malik. Buildings are AV12, shed is AV10. Windows are fire points (two figures per window, 45 degree arc as per pintle mounts), doors are access points. Max 12 figures (6 for shed). Counts as difficult terrain to move inside. Orks/Tyranids set up first. 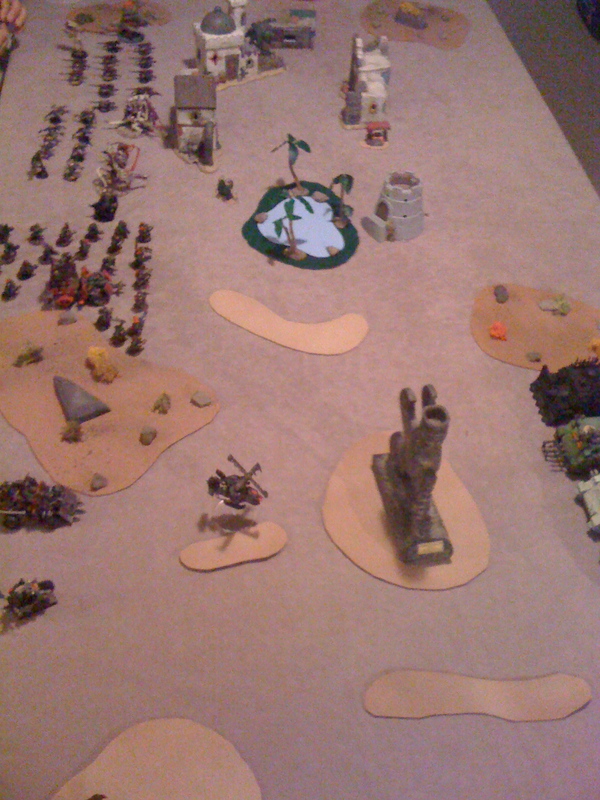 The Orks field a large unit of Shoota Boyz, a smaller unit of Choppa ‘Ard Boyz (in a Trukk), a unit of Meganobz and a Warboss (in a second Trukk), one Deffkopta, and biker warboss Wazdakka Gutsmek. The Tyranids field one unit of Gaunts, one unit of Genestealers, two Carnafexes, a Zoanthrope, and a Hive Tyrant plus retinue. Chaos sets up largely facing the Orcish army across the dunes, hoping to crush them early—leaving the town (and its two wells) largely open to the Tyranids. They field a Vindicator, three Rhinos with Plague Marines, an Obliterator squad, and a Daemon Prince with a Lash of Submission. Two units of Terminators wait to deep strike in—one of them including a Sorcerer with a second Lash of Submission. Chaos seizes initiative. 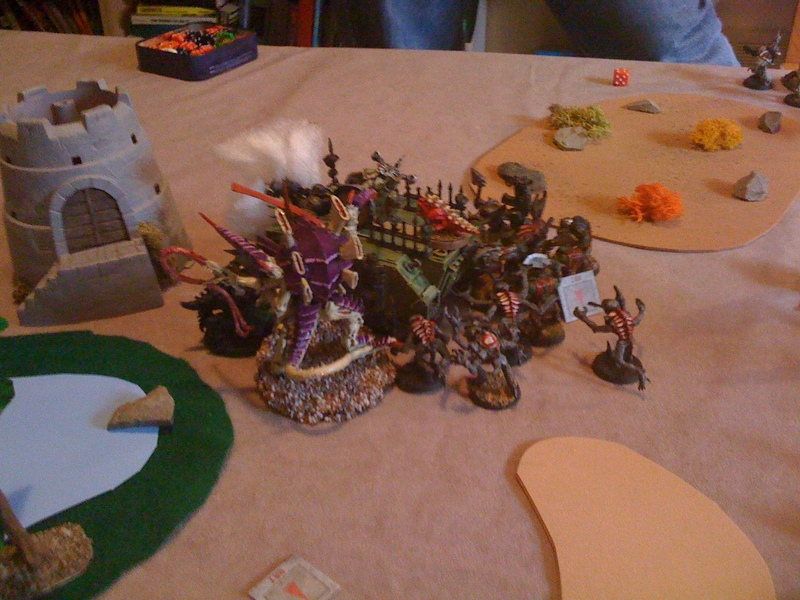 The Daemon Prince with Lash takes control of largest Orkish unit and bunches it up–allowing the Vindicator to hit the Shoota Boyz with a large blast. A dozen orcs, almost half the unit, die. Two Plague Marines die from their own overheated weapons while shooting at Carnifexes. Chaos units move up. The Vindicator is destroyed by return fire. 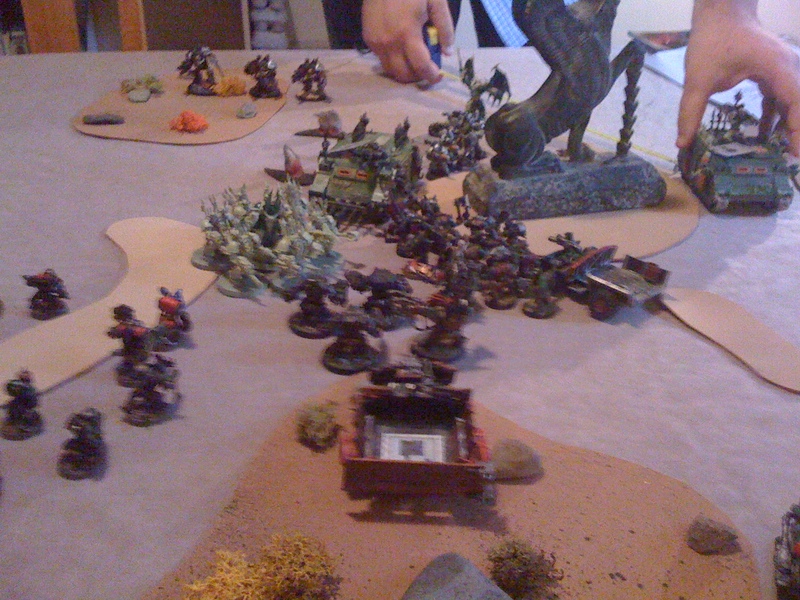 The Orks advance, and the Tyranids run to reinforce their beleaguered allies. Advantage: Chaos. All sides move up. Both units of Terminators fail to deepstrike. Some more shooting, one Ork truck immobilized. Meganobz disembark and move forward, as to the Choppa ‘Ard Boyz. A Deffkopta destroyed. The Rhinos are still largely unscathed. The Gaunts scuttle into a building in town near one of the wells. The Daemon Prince takes control of the Choppa Boyz, but only manages to send them back a few inches. One unit of Terminators (with Sorcerer) deepstrikes in front of Orks, and hoses down the Shoota Boyz with flamers. The Ork unit is now down to 3 figures from original 26, but–miraculously– it rolls double 1s and its morale holds! A Plague Marine unit disembarks from a nearby Rhino, and kills a Ork Choppa Boy or two with weapons fire. The Rhino to the far east of the Sphinx decides there are too many horde allies in the dunes, and withdraws so that it can redeploy eastwards. The unfortunate Terminators are flamed by the Meganobz, and then assaulted in turn by the Hive Tyrant, Meganobz, the Ork Warboss, the Genestealers, and Choppa Boyz. The entire unit, including its Sorcerer, is slaughtered. The tide of battle begins to turn. Chaos sends two Rhinos back towards the town. The final unit of Terminators fails to deepstrike again. The Orks and Tyranids synchronize perfectly in a concerto of armour-killing: Wazdakka rips open a Rhino with his dakkakannon, and a Tyranid blast kills most of the surviving squad. The second Rhino is charged by the Hive Tyrant, Genestealers, Choppa Boyz, and the Ork Warboss. The Warboss’ squig, in the last attack of the assault, finally pops open the APC and the squad inside has nowhere to go. It dies. Finally, back in the town, the second Carnifex immobilizes the last Rhino. Some lucky Ork shooting also takes down an Obliterator, and brings the Daemon Prince to within one wound of death. Advantage: Horde allies. With only one usable squad of troops left, and with the Horde allies likely to take most of the objectives, Chaos concedes. The Horde triumphs!